The days of the highly expensive component stereo systems are gone. No more turntables, tape players, CD players, tuners and amplifiers. (although I still have my complete system) The influx of Bluetooth capable speakers, headphones and everyday items has been steadily increasing over the past few years as users demand more from the items that they purchase and utilize everyday. One shouldn’t be surprised when that capability has been translated into speaker systems that provide portability and ease of use. 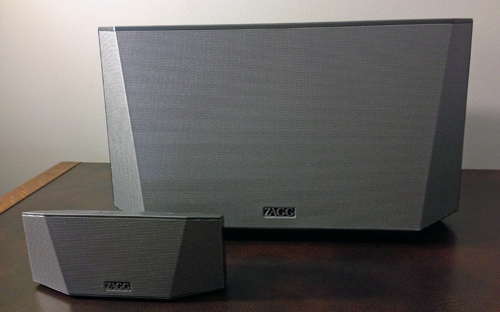 ZAGG’s latest item, the Origin 2-in-1 Bluetooth Speaker System, provides the user with both in a well designed product that provides both in a unique way. To start with, the system is well designed and thought out. First impressions when you open up the box that the system comes in is that the system is that it is not something that you want to lug around with you when you want Bluetooth capability when you are headed to the beach, the backyard for a cook out or to the park for a get together. However, looks can be deceiving because what you see at first glance is the desktop portion of the unit. The box that the unit comes in itself is not your normal rectangular box; on the left side of the box it is partially cut at an angle. When you open up the box, you immediately see the styrofoam cover over the unit with the instruction manual and two cable sets. Pick up the cover and the plastic wrapped unit is below. As you empty out the box, you find the wireless remote, a 3.5mm auxiliary cable, a mini USB cable, the charging cable/power unit and the instruction manual. 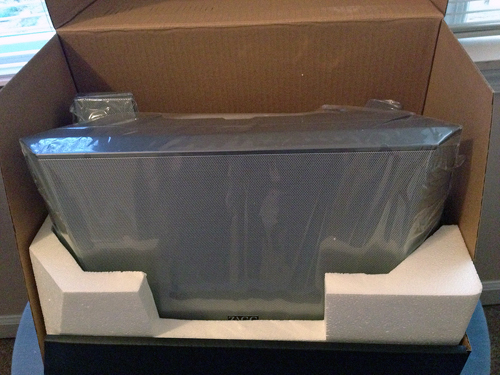 The first thing you notice when you go to pick it up is that this is not a cheap plastic unit, it has some heft to it. When you get it out of the box, its design is angular and yet being made of plastic, it doesn’t look or feel cheap. You immediately notice the smaller portable unit is tucked into the top rear of the unit and when you remove it, its design is the same as the main desktop unit. The portable unit is held in place by magnets so there is no danger of the unit falling off of the desktop unit when you move it around. On the rear of the portable unit, there is the on/off switch, the micro-USB in port so you can charge the unit when it’s not docked with the desktop unit, an auxiliary in port for you to connect your phone, tablet or other portable music device and finally the Bluetooth button to pair up the Origin with your Bluetooth enabled device. The unit emits a confirmation tone to let you know that the device is paired. The main unit is similar with the controls as it has the on/off switch, an auxiliary in port for you to connect your phone, tablet or other portable music device, a USB power out mac so you can charge up whatever unit you are syncing and the 16v DC jack that connects your AC power adapter. On the top of the main unit is the volume up/down buttons while the portable unit has volume up/down buttons, play and forward/reverse buttons. Once you’ve docked the portable unit with the desktop and allowed it to charge, the unit is good for up to 15 hours of play time. At 8” in height, 14” in width and 6” deep, the Origin has a small size that allows it to fit comfortably on a desk or a shelf, wherever you want to place it for the best sound placement. The portable unit is 2 3/4” in height, 6 1/4” in length and 1 1/4” deep, easy to pop into a pocket, purse or backpack for you to take it where you want. The portable unit is the actual Bluetooth connection that you sync to and once you mate it with the desktop unit, it is how the desktop unit obtains the connection. The magnetic contacts ensure that the mini stays with the desktop unit, it will not fall out. What I came to enjoy is the flexibility of the Origin. If I wanted to have the capability of sitting outside or while working in my garden, I would just take the portable unit with me, synced to my iPhone and while relaxing or “working” I was able to enjoy my music. I could take the unit with me from my work den into another room and still enjoy the music I was playing. The other part of the equation was the fact that once back in my work space I would just position the portable back in the desktop unit and I would have a deeper, richer sound plus I would have the ability to control things via the remote. I have even moved the entire unit into different parts of the house to enjoy the deeper rich sound while I’m relaxing. 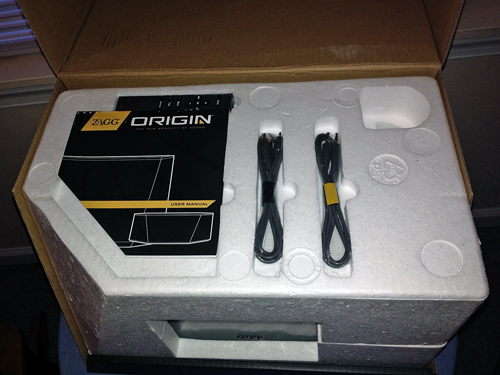 I have tested the Origin system with everything I have that is Bluetooth compatible. I’ve synced my Mac Mini, MacBook Pro, iPhone and iPad with the unit and have encountered no problems whatsoever. I have also used the 3.5mm auxiliary cable with all of my items and again, no problems at all. Having the remote control with the desktop unit is great as when I’m sitting and working with the music playing and I get a phone call on the house phone, I just press the mute button on the remote and I can enjoy a conversation without having to touch the item containing my music. Now for the purists out there, an advisory note to let you know that if you’re listening to music with the mini unit and go to connect the mini with the desktop unit, you will experience a momentary pause as the two units connect with each other. I didn’t think this was a big deal and you can always connect in between songs or pause your music while you let the units connect. I will also tell you that the difference between the two units is clearly evident with the desktop unit providing better bass and response then the portable unit. But for the price and for what you get, the ZAGG 2-in-1 Origin is a unit that you really do need to consider if you are looking for a unit that provides you with more capability than a more expensive fixed sound system that doesn’t give you the flexibility that you are seeking. The Origin fits in well sitting on your desktop or on a shelf providing you with music that easily fills whatever room you’re in. Consider what you are getting with the Origin; a system that provides portability, flexibility, recharges the portable unit when both units are together, an auxiliary input so as to not waste your battery reserve, the ability to recharge the portable unit via the micro USB cable and realistically, two speaker systems for the price of one. Yes, there are systems out there that will deliver outstanding audiophile-pleasing sound but you will be hard pressed to find one that sells for less than $300.00 and really good portable Bluetooth speakers for less than $100.00. Here you are getting both for a relatively reasonable price of $249.00. 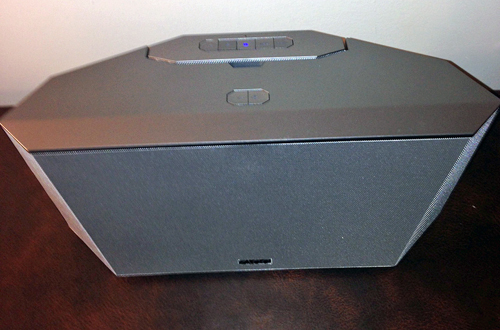 The desktop has two 1” tweeters, a 4” woofer, two full-frequency 2 1/2” speakers, and is rated at 20Hz-20KHz. 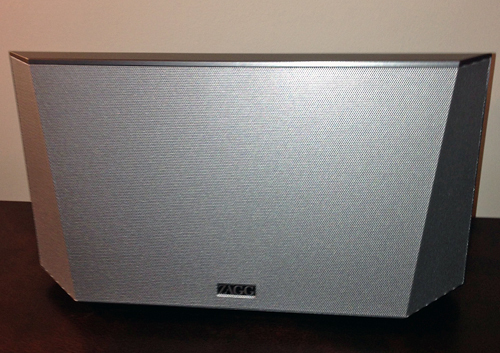 The portable unit has two 1 1/2” full-range speakers and is rated at 80Hz-15KHz. 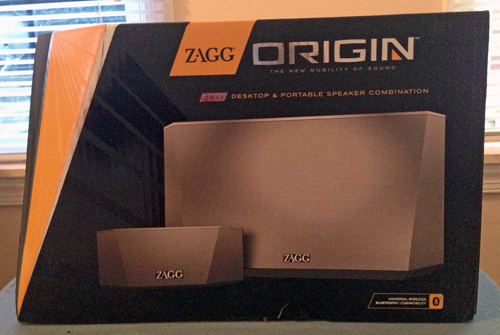 All in all, based upon my use and its capabilities, I give the ZAGG Origin 2-in-1 Bluetooth Speaker System a My Mac rating of 8 out of a possible 10.